File Types: PNG, JPG, All Files; File Size: 109.19 MB; DPI: 300 DPI. This Sweet PINK Rose acrylic floral set was hand-painted in layers of paint and blended so the flowers stand-out against dark or light background. THIS SET CONTAINS 49 files. - All elements are colored and ready to use. - Watermark will be removed. ? You can use this set on personal or single commercial project with Standard License . If you would like to use this set for items for sale you have to select Extended License? Keywords: roses, pink, garden, nature, beautiful flowers, bouquets, wedding, diy, invitation cards..
Best ddsign template, vectors, illustrations, video templates from creative professional designers with After Effect, PhotoShop, 3DS Max, Cinema 4D or InDesign. Full details of CreativeMarket Sweet Pink Roses- Watercolor Floral 520639 for digital design and education. 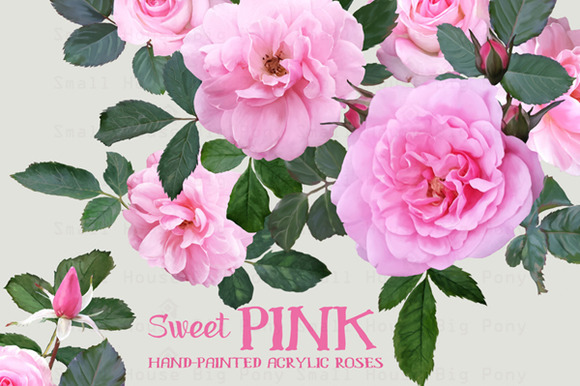 CreativeMarket Sweet Pink Roses- Watercolor Floral 520639 desigen style information or anything related.